Super ! Fits 100%, Thanks !!!! Soo, I printed this, over 6 hours print at 20% infill. The problem is after cooling down, the whole part got warped on it's length. The sides are sturdy because of the big L shapes printed on top, but the middle that makes room for the belt tensioner is structurally weak and warps... Bottom part of the piece that's on the heat bed is hot, top part is cooled while printed. After the whole piece is finished and the cooling of the bottom part proceeds, it starts warping :(... Can I maybe solve this with smaller hexagonal infill shapes? You have a general problem with bed adhesion. I am almost certain that changing the infill will not solve your problem. Have you tried a different filament manufacturer? Nope. Well, generally PLA plastics behave like this. I was just wandering if there is a solution for it. I must add that I'm using 85 degrees C for the heatbed and 210 for the extruder. Could that be it? Go with 195 on the PLA and lower the temp on the heat bed as well. Just want to say thanks for a great design, I've been using this for over a year now, and in conjunction with my top frame brace my frame is very rigid. I've recommended this many times, and will continue to do so. You're welcome. Remember that the front brace goes hand to hand with the rear brace. Thanks, but I'm planning on moving the motor to the back of the the frame, so your rear frame brace won't work. Made one (or several, poor bed adhesion but I got it to work with a raft and 0.2 air gap height) and installed it while installing an ultrabase bed, it instantly corrected the bending in on my anet's front frame. Just printed the rear one and fitted it last night, will print this one tomorrow. Curious though why on the front brace you put holes for the rods, instead of U-channels like on the rear brace. That would allow installation then without needing to actually disassemble the whole front end. Was there a reason for this? 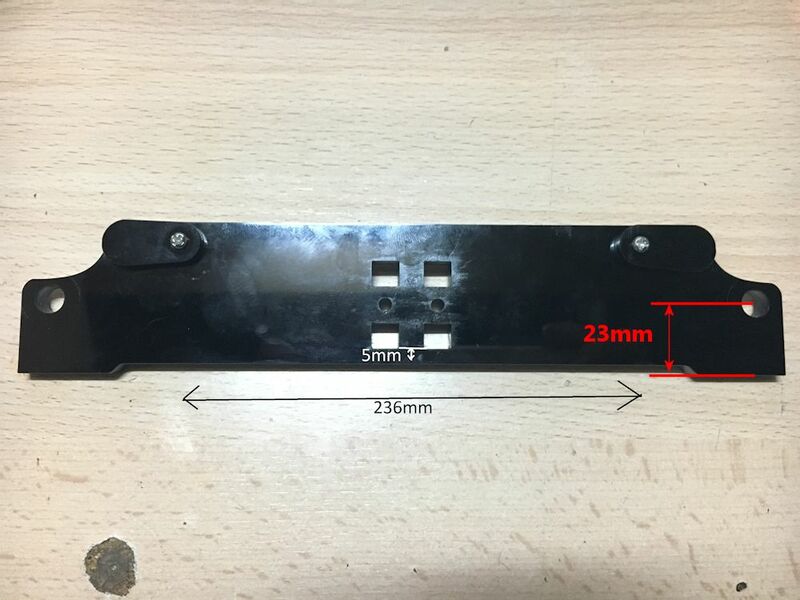 The front nuts are easily removed with out compromising much of the setup of the printer. With the rear brace you would have to disassemble more parts of the printer. I felt that wasn't worth the effort. Ah; got it. Makes sense. Hi. Does these brace affect the y axis travel in any way? I wouldn't think so, neither in a negative nor positive way. Is there an Anet A8 vibration dampener foot like this that works with this? Hi, i have a quick question. Would this work for the Tronxy X8 version as well. They do look very similar (Anet A8 and X8). If anyone knows and tried that already i would love to get feedback on this. I printed this for my Anet A8 purchased in December 2017 and it fit great when used in conjunction with a screw type Y-tensioner by Photograaf16. The only issue I notice is that the rear acrylic frame piece now bows significantly more so it will need to have a brace printed for there as well since this causes the motor not to sit at 90 degrees to the rear frame. Great work Leo_N! Front and rear brace are intended (a must) to be used in together. Well just got my Anet A8 a couple weeks ago. and unfortunately the holes in my front acrylic do not even come close to lining up. On mine the holes are lower. The top of the hole on my acrylic just about lines up with the bottom of the hole on this part. Looks like they are now putting the holes lower for the threaded rods now. or at least they did on mine. Probably sold as an Anet A8 but isn't. I don't know what you mean with "The front acrylic frame is NOT symmetrical. ", I measured mine with a precise caliper multiple times in different ways and it was always perfect symmetrical. Has this maybe changed? I changed the text in the summary. It seems newer models are now symmetrical. I got my A8 just a few weeks ago and I noticed, that the front acrylic frame is symetrical with my A8. Have you heard of this and does your frame fit anyway? I printed it, I liked it a lot! Very nice but your front acrylic frame is mounted incorrectly. Check out my picture #2 for reference. The front brace reduced around 0.12 mm of backlash that I was having in the y-axis down to about 0.04 mm. The rear brace (tightned up against the rear motor) reduced y-axis backlash to under 0.002 mm -- as perfect as I can measure it. These prints are big, and take a long time, but are probably the best thing one can do for an A8 after the fan nozzle. Thanks for the fantastic designs! First thing is to print the Mistral 2.1 to make sure you have good qualtiy prints. Then front and back braces to remove what you have mentioned above. Next is to reduce x-axis motion by printing my Hulk braces. That is all you need to improve the A8 printer. Thank you for this post. I printed it and installed on my A8 3D printer. Fits perfectly and prevents my acrylic frame from bending due to belt tensions. This thing works. Great to read. Is the A8 a newer version? I just got his from Gearbest last week. I assume it is the newest. I am new to this. Ich habe mir vor 2 Wochen den Drucker gekauft und ohne Probleme den Remix https://www.thingiverse.com/thing:2397219 Gedruckt. Ich habe dafür mal 2 Bilder angehangen. Kannst bitte vom ganzen Drucker ein oder zwei Bilder machen? Konkret wie die Gewindestange von vorne nach hinten verläuft. Ich hoffe, dass unter den Bildern etwas ist, was du verwenden kannst. Ansonsten mach ich morgen Abend eine kleine rundfahrt um den Drucker, sind ein paar Kleinigkeiten, die anders sind. Die Bilder nach zu urteilen muss ich feststellen das es sich nicht um ein Anet A8 Drucker handelt. Vielen Dank für das Aufklären per Privat Nachricht. Thanks - it works great and was one of the first mode I made for my A8 - followed by the rear brace.. Try to level your bed correctly. Worked for me. What does this brace do? Does it reduce vibration or something? The primary goal of this brace is to eliminate the acrylic front frame piece from bending. It also adds is stability for the front portion of the printer bed. You will also need to use my back frame brace for the same reasons. I cannot get this design to fit on Cura, HELP! Yep, 5 hours is what you should expect. Danke dir, damit ist das Wochenende ja dann auch durchgeplant ^^. Leo are You sure that 104mm should be on the right side ? many ppl claims oposie. Absolutely! I am 110% sure. Of coarse this is only on the assumption that Anet didn't change anything to the design of the printer in the mean time. Since installing this and the rear brace.. I'm getting kinda loud vibration/pop in the frame, and a "twanging" from the top of the frame. I think its based in the X-axis but cant be sure. Any ideas? erstmal Danke für das tolle und zugleich einfache Design. Meinen ersten Druck musste ich wegen schlecht gewickeltem Filament leider bei 12mm abbrechen, allerdings habe ich da beim Probe-Anlegen bemerkt, dass V1.1 das kürzere 104mm Stück auf der linken Seite hat anstatt rechts wie die erste Version. hatte zuerst Cura im Verdacht aber bereits im thingiview erkennt man den Unterschied. Ich habe das Modell jetzt gespiegelt und drucke es erneut und hoffe, dass dann alles klappt und es passt. Nein nein... Du musst das Teil so ausdrucken wie von mir vorgegeben und stattdessen das Acryl Stuck des Druckers umdrehen! Also ist Version 1.1 absichtlich eine Spiegelung zu Version 1? Nein, es gibt keine Spiegelung zwischen 1 und 1.1 die sich unterscheidet. leider doch. Man sieht es bereits in thingiview wenn man beide Versionen auf die Frontseite dreht und dann schnell zwischen beiden wechselt, dass der Freiraum für den Zahnriemen nach rechts und links springt. Ich habe auch beide Versionen in tinkerCAD überlagert, Bohrungen und Außenmaße passen überein, der Freiraum für den Zahnriemen ist dabei um mehrere Millimeter verschoben. Ich sitzte nun mit Unfassbarkeit vor meinem Rechner! :-( Du hast recht!!! Scheinber ist bei der Bearbeitung beim CAD Zeichnen was schiefgelaufen mit der von Dir geschilderte Konsequenz! Heißt für Dich spiegelverkehrt drucken oder warten bis ich es korrigiert habe. Ich werde es jetzt spiegelverkehrt drucken, da ich gleich zur Arbeit muss und für das WE noch die Verstärkung für die Rückseite und der Um- und Einbau der Teile und Elektrik geplant sind. Neue Version als 1.2 hochgeladen. Thank you Leo_n This was one of my most important upgrades..
You are welcome. Be sure to make my rear brace as well as it's just as important! Hi, würde ein Rahmen der die Vorderseite mit der Mitte verbindet Sinn machen, oder gibt dies hier genug Stabilität? Leider kann ich nicht ganz folgen. Kannst Du vieleicht eine Skizze machen? OK, habs nun verstanden. Die Lösung bringt m.M.n nichts. Es könnte sogar passieren wenn das gedrucke Teil krumm vom Heizbrett kommt es sogar negative Auswirkungen auf den Rahmen haben könnte. Thanks for the model, what infill do your recommend ? It's documented in "Print Settings". I think it'd be nice if you'd have included a belt-tensioning. Its well made so the original belt holder and printed tensioners fit in it - but an included tensioner would be the best solution i guess, to have that enforced aswell in one Piece. That's not a very good idea. If you put the tensioner on the printed brace then it will have to take all the stress. If the tensioner is mounted on the acrylic frame then the stress is spread out on both parts. Anyone else had serious warping issues printing such a long piece? Mine warped a lot across the longer edge printing it in PETG, 70° heated bed, 230° nozzle, 50mm/s and 0.3 layer height. Just printing this... Could you recommend a Y belt tensioner to go with this design? Great! Thanks for the fast answer. ! In your slycer program you need to rotate it on the Z-axis to around 45° until it fits nicely on the bed. Also be sure that scale is set to 100%! Dang, I printed one before figuring this out! I've now gone into Cura prefs and unchecked "Scale large objects" and "Scale extremely small object". I prefer dimensional accuracy. JUST LIKE THAT. That's looks perfect now! Hey Leo. Sieht echt super aus. Kannst du auch noch eine Version machen, die man auf einer Platte verschrauben kann? Ja, das ginge. Wo möchtest du die Bohrungen plaziert haben? Schaut doch gut aus. Einfach bei beide als "remix" reinstellen. Gib Bescheid falls ich helfen kann. Hey Leo beide Versionen sind online. Jedoch kann ich bei der anderen leider keinen remix einstellen, da er mir sagt, dass du dies nicht wünscht. Würde natürlich gerne sagen, dass es von dir ist. Ich habe ja nicht viel gemacht. Das sollte nicht sein. Habe die Linzenz richtig gestellt. Kannst jetzt als Remix reinstellen. Found my issue – Brace works Perfect! 2017 model Anet A8 !! - - I had a cord on the rear brace that was pinched ever so slightly on the underside, underneath the back brace and made the front brace seem raised. Taking it apart the second time over, I found my mistake. Amazing design Leo this gives real stability to the frame. Thanks for sharing your work! Excellent !! Looks like the laser cut is a bit off on your printer. However, in your case I think the easiest solution is to remove some material from the printed brace. I had the same situation, mine is off by a bit also. It may be a huge batch or they changed the design, mine was purchased Apr. I've uploaded version 1.1 to accommodate the variations of the front acrylic frame being shipped. Hi. Vielen Dank für die front- und back-frame-brace. Die passen wirklich sehr gut! Vor allem das hintere Teil passt hervorragend! All...Is it my 2017 model of the anet a8 which has new measurements on the acrylic frame?? For me this lifts the frame up on the front and back about a quarter of an inch. Is this the intended design that the printer sits up on top of the printed part so the printer is resting on the printed support piece?? I don't don't know if the manufacturer changed anything on frame dimensions. That's something I can't control. Fact is with the brace installed the bottom should been even with acrylic frame so that both rest evenly. Maybe recheck if your scaling is correct? Thanks Leo great design massively improved the stiffness of the whole frame as for previous comment I had no issue with scaling printing perfect first time. My first attempt seemed far too small. Indeed, upon checking the setting in Cura, the length of the longest edge was set at 165mm. The acrylic plate on my printer is 235mm. Be aware of your sizing and scale accordingly.